Of course! I didn't need a study for this result but it's good to read. Junk food is ok, in moderation. Our kids view it as a treat, I'm happy with that. They feel extra special if they get dinner out. Honestly, it's expensive and unnecessary. Pack a lunch, just part of being a parent - save some money and feel good about it. 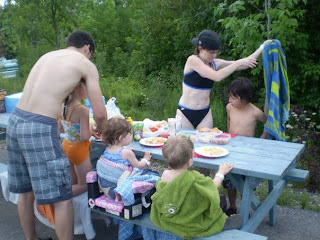 Picnic Lunch after a waterpark adventure - make your own sandwich with veggies and dip!